Glitter Bay is an oceanfront apartment/condo complex that enjoys a great location near Holetown as well as easy access to the sandy beach. Unit #109 is a 2-bedroom, 2-bath rental that will comfortably sleep up to 5 guests. The spacious living area is perfect for unwinding - whether you choose to watch TV, play board games, or just enjoy the comfortable island breezes. Or, step out to the spacious patio, where you have access to the communal pool and garden paths. This is one of the few apartments in the complex that has convenient access to the gardens. Then take a stroll, or head to the beach for a day of sun, sand, and water sports. Glitter Bay Estates boasts the unique fusion of a self-catering holiday with all the benefits of a top class hotel. An all-suite property, it’s also located on the one of the best beaches on the west coast of Barbados and convenient to Holetown’s restaurants, bars, supermarket and shopping malls. Glitter Bay Suite 109 “Sweet Fuh Days” is a two-bedroom apartment that has been remodeled and refurbished. The open plan living area makes it spacious, airy, and bright – perfect for families. The pool is just steps away, and a beach attendant can reserve umbrellas and loungers each day (no rushing to the beach at 6 am!). The air-conditioned en-suite master bedroom, with ceiling fan, has a king bed, light wood furnishings, lots of cupboard and drawer space, and it leads out to the spacious patio with views of the pool and the gardens. Soft furnishings are in cool blue and cream and add a serene feel to the room. The master bedroom has a 26-inch LCD TV with cable, which is linked to the living room system. The en-suite bathroom has a step-in glassed shower and double sink vanity. The second bedroom has three separate beds (two are together as a king), AC, a 19-inch TV, DVD player, and a ceiling fan. The light wood furnishings complement with cool green and corals, adding a very tropical feel to the room. The second bathroom is located in the hallway and has a curtained shower and tub and a double sink vanity. The spacious, fully equipped kitchen has granite counter tops, a large sink, and electric counter-top stove and oven. There is an upright fridge and freezer, and the kitchen is also equipped with a microwave and dishwasher. Here you can prepare your own gourmet meals or let the nearby patisserie in Holetown fix your meals and deliver them right to your door. The living area has a built-in triple sofa-seater and a rattan armchair and footstool. The entertainment area includes a 32-inch LCD TV with cable and DVD player, and there is an iPod docking station as well as a CD player. This is a perfect space for the family to watch TV or play one of the board or card games that the owners have supplied. The apartment also has an iron and ironing board for your convenience. All linens and towels are provided, and beach towels are available at the Concierge. Both the living area and the master bedroom lead out to the expansive patio. The large wooden dining table seats six, and there are additional sleeves to allow for up to eight people. The patio seating area is the perfect setting for a pre-dinner cocktail, and it has direct access to the pool and garden paths. This is one of three on the property that has the unique and convenient feature of gate access to the pool and gardens. 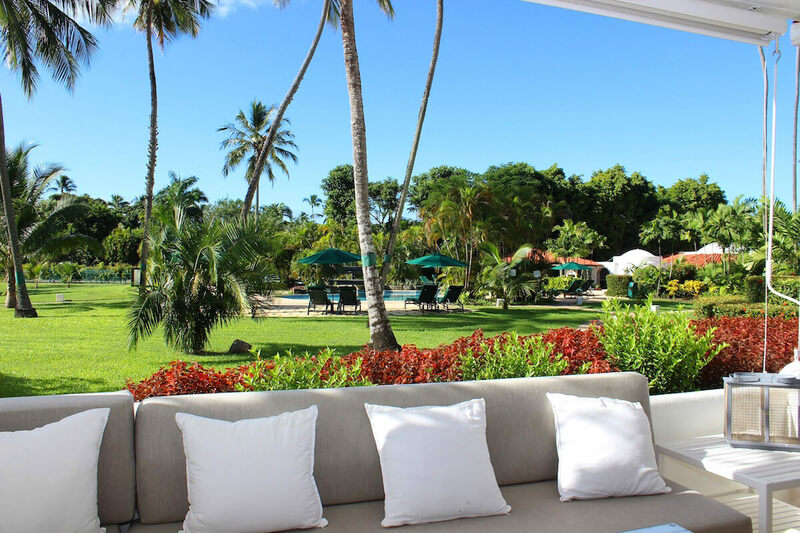 The patio has a great view of the extensive gardens, pool, and even a small glimpse of the sea past the flowering shrubs and many towering coconut trees scattered on the property. Can be arranged at an additional cost. a cook is available at an additional cost. Tennis equipment available at an extra cost.